Volcanic activities from Mount Redoubt in the last two months have provided many planning and training opportunities for Airmen here. Elmendorf's Heating Ventilation and Air Condition section has its own plan and ideas for dangerous ash fall here. In the case of volcano eruptions, with varying conditions, the average reaction time HVAC specialists have is around two hours. By then, they have to set all their plans and training into motion. "We have a Direct Digital Control system of our HVAC equipment," said Johnny Perry, the 3rd Civil Engineer Squadron HVAC work leader. The DDC, according to Perry, is connected to approximately 110 buildings on base. The DDC has the ability to shut down all HVAC equipment attached to the building, meaning that all heating or air-conditioning, air ducts, boilers, and etc. will be shut down. Not only will this process shut down the heat and the AC, but it will also stop all air intakes into the buildings. "It's almost a push button operation were we can turn off noncritical facilities as far as air handling facilities are concerned. It'll shut down the ventilation ... so we don't draw in air from the contaminated ash area," he said. With the DDC active, the HVAC work leaders, as well as the other HVAC members who have the proper authority, may access and shut down specific equipment as needed. If the condition gets to an even worse state, the DDC also has the ability to shut down critical equipment and facilities too. "We have a secondary shut down and a primary shut down, which shuts down everything, and then we can bring it all back up safely," said Perry. The DDC is convenient for the HVAC team because, for them, it is easily accessible. "It's a browser-based program that is accessed from any computer around the world, if you have the access level to get into the system," said John Elsholz, a 3rd CES HVAC work leader. "One click gets it quick, that's my motto," he said in reference to the DDC system. HVAC team members do have access to most equipment and buildings on base, but some of the older buildings have yet to be added to the DDC. Since these buildings are not fitted with the DDC, the team must manually check or shut down necessary systems. "We dispatch crews based on a priority listing that we have in the shop," said Perry. All of the manual shut downs must be finished within the two-hour window from when the volcano first erupted and an ash cloud is headed toward the base. The HVAC team will first determine if the systems can be run without damage before they shut down the systems. If ash fall is going to be damaging to the systems or is around one-eighth of an inch or one-quarter of an inch the team will begin to shut down the systems. While there is a lot of work to be accomplished in little time, the HVAC team does have some words of wisdom for those Airmen that would like to help. "We prefer to do it ourselves rather than having our customers go out there and do it," said Perry as he leaned back in his chair. "We don't want them to accidently turn off equipment that shouldn't be turned off." The HVAC team said the best thing that any Airmen can do to aid them in their job is to follow the ash fall prevention operations that have already begun around the base. Base members should be doing things like covering electronic equipment with plastic or checking windows for drafts, and covering and reporting broken windows and doors. Also, Airmen can help by turning off circulating fans or any other air flow devices. The HVAC team has been doing its best to keep Airmen safe and comfortable to get the mission accomplished in these arctic conditions, and uncertainty of the next volcanic eruption. It might be (and is likely) just normal behavior for Popocatépetl in Mexico, but the volcano produced six plumes over the last 24 hours, according to a report out of Mexico City (in spanish). Officials from El Centro Nacional de Prevención de Desastres (The National Center for the Prevention of Disasters - Cenapred) say that the plumes appear to be mostly water vapor and other volcanic gases, but remind people living near the volcano to be vigilant. Popocatépetl is only 70 km from Mexico City, so any major eruption from the volcano could affect life and air travel to the major metropolis. The last major eruptive period at Popocatépetl ran from 1996-2003, producing VEI 3 eruptions, but the volcano has been producing smaller eruptions since January 2005. The volcano produces a mixed bag of activity, with ash fall, lava flows, pyroclastic flows and lahar generation and might be one of the more hazardous volcanoes in the Americas. Mount Redoubt, a volcano situated to the southwest of Anchorage, Alaska, has erupted several times in the past month. The strongest eruption had an ash cloud that rose to around 65,000 feet, with nearly a dozen other eruptions spewing ash to 60,000 feet. If Mount Redoubt behaves as it has in the past it may continue this pattern for several more months. It has been known for years that volcanic activity can influence weather patterns around the globe. The ash and other aerosols released into the atmosphere from volcanoes can block a portion of the Sun’s energy from striking the Earth, which has historically caused a net cooling of the planet. As of now, Mount Redoubt has not released enough ash for this to be a concern. Volcanic ash has another effect – brilliant sunsets – and some of the ash may end up over our area this week, so be on the lookout for brighter evening colors. Chile's Llaima volcano, one of the most active in South America, spewed out a river of lava more than 1,100 yards (1,000 metres) long on Saturday in a fresh eruption, prompting officials to order dozens of people to evacuate. Llaima, which lies in Chile's picturesque lake region about 435 miles (700 km) south of the capital Santiago, erupted on Jan. 1, 2008, and has belched rock and ash sporadically since then. The lava and hot gases from the latest eruption are melting snow on the sides of the volcano, and authorities say some towns are in danger of being hit by mudslides. "We are going to start the evacuation of some people who live in sectors that are particularly vulnerable to the risk of ... avalanches of mud due to melting snow," Johaziel Jamett, head of the early warning center at the National Emergency Office, told Reuters. "It is a spread-out population. We are talking about a few dozen people, not a massive evacuation," he said. Twelve people have been evacuated from the Conguillio national park surrounding Llaima, including two tourists. Police have closed the park, and troops have been dispatched to the area, the emergency office said. It said an ash-swollen river near the volcano had swept away a pedestrian bridge, but there was no other damage. Bright red bursts of lava were visible in the night sky as Llaima erupted. The office said on its website that there were "permanent explosions that reach 600 metres (650 yards) above the crater. Falling ash is visible and ... a flow of lava of more than 1,000 metres (1,100 yards) has been observed." Chile's chain of some 2,000 volcanoes is the world's second-largest after Indonesia. Some 50 to 60 are on record as having erupted, and 500 are potentially active. The 10,253-foot (3,127-metre) Llaima was the second to erupt in the past year. The Chaiten volcano, 760 miles (1,200 km) south of Santiago in the Patagonia region, erupted last May for the first time in thousands of years, spewing ash, gas and molten rock and prompting the evacuation of thousands of people. Ash from Chaiten soared 20 miles (32 km) into the sky, swelled rivers and caused floods that damaged dozens of houses and destroyed much of the nearby town of the same name. Chaiten erupted again in February, leading to the evacuation of residents who had rejected a government plan to abandon the town and rebuild it a few miles (km) away. After days of quiet, Alaska's Mount Redoubt volcano roared back to life Saturday morning with a new eruption that pumped smoke and ash 50,000 feet into the atmosphere, the Alaska Volcano Observatory reports. The eruption comes just after officials had given the go-ahead to remove millions of gallons of crude oil from an oil storage facility 20 miles downriver from the mountain. There are concerns that the terminal, where more than 6 million gallons of oil is stored in two tanks, could be damaged and cause a catastrophic oil spill that would damage Cook Inlet's valuable fisheries. Original plans called for the oil to be transferred Saturday from two large tanks to a tanker ship and leave nearly 1.7 million gallons in each tank. Some oil needs to remain in the tanks to prevent them from becoming buoyant and floating away if there was a flood, according to the Coast Guard and officials with the Cook Inlet Pipeline Co. The tanks now are each holding 3.1 million gallons. It was not immediately clear how the morning's blast would affect those plans. A flash flood warning was issued for the Drift River, which flows from the mountain and passes by the oil storage terminal. Air traffic in and out of Anchorage and the Kenai Peninsula was operating normally as of 8:30 a.m. This morning's blast comes a day after the Alaska Volcano Observatory lowered the threat level from "warning" to "watch," after activity quieted. Mount Redoubt began erupting on March 22. Since then, the volcano 100 miles southwest of Anchorage has produced numerous large explosions that have sent mud and rock cascading down its flanks. Some of that mud and debris has reached the Drift River Terminal, 22 miles away. Sen. Lisa Murkowski has the right approach to secure funding for volcano observations — make it part of a national program. Former Sen. Ted Stevens successfully earmarked money for many years to make the Alaska Volcano Observatory an effective early warning system and scientific enterprise. But it was never just about Alaska. So much national and international air traffic passes through Alaska airspace that up-to-date tracking of volcanic hazards should be a national priority. Besides, Alaska has no monopoly on smoking mountains. Other parts of the country deserve watching as well. The most violent volcanic explosion in recent memory occurred not in Alaska. It blew the top of Mount St. Helens in Washington on May 18, 1980. The ash blanketed much of the Pacific Northwest. Having an effective detection and monitoring system in place for such events makes sense. Mount Redoubt’s recent eruption couldn’t have been better timed as a rebuttal to Louisiana Gov. Bobby Jindal’s mocking of volcano monitoring during his response to President Barack Obama’s first address to Congress. Jindal seemed too ironic as the chief scold on this subject, since his state benefits from an extensive federal program designed to detect hurricanes. He would mock that effort at his political peril, and for good reason. It’s worth having the information. Jindal, to his credit, claimed he was objecting not to the monitoring itself but rather to its inclusion in the stimulus funding package. That’s a reasonable point, but it wasn’t how it came across at the time. It’s unlikely that the expenditures for volcano monitoring will match those devoted to hurricane monitoring, and that’s fine. Volcanic eruptions are less frequent and less destructive, most of the time. They still bear watching, and the federal government is the appropriate entity to pay for the eyes. Volcanic activity at Alaska's Mount Redoubt has caused UPS to reschedule or relocate some flights, but the company says that hasn't had a major impact on its ability to deliver packages. Anchorage, about 100 miles northeast of the volcano, is the UPS gateway to and from Asia. The volcano spewed ash 15,000 feet or more into the air before erupting Tuesday. UPS has been getting about three flights a day into Anchorage to serve customers in that area, flying mainly in daylight hours for safety reasons, spokesman Mike Mangeot said. Instead of using Anchorage as a jumping-off point for Asia, the company has shifted those flights to Seattle, Portland and Honolulu until the volcano quiets down, Mangeot said. ResCare said yesterday that it was increasing its West Coast footprint by acquiring a company that provides assistance and services to more than 1,200 people in Washington state. Louisville-based ResCare said it's buying Home Care of Washington, a Spokane company that offers personal care, housekeeping, meal preparation and other home services in 10 counties. Annual revenues are expected to be $20 million, ResCare said, but other terms were not provided. Sypris Solutions, a Louisville-based manufacturer, reported a loss of $122.25 million, or $6.65 a share, in the three months ended Dec. 31, including one-time charges related to its restructuring. In the final three months of 2007, Sypris lost $2.2 million, or 12 cents a share. Revenue declined to $94.5 million, from $103.7 million the year before. For the year, revenue fell to $411.3 million from $435.9 million in 2007. Including charges, for the year Sypris posted a loss of $130.6 million, or $7.11 a share, compared with a 2007 loss of $2.1 million, or 12 cents a share. Plant consolidations and other downsizings "are now ahead of schedule," Jeffrey Gill, Sypris president and chief executive, said in a statement. Completion is expected in the second half of the year. Mount Redoubt Volcano, 106 miles southwest of Anchorage, Alaska, erupted explosively more than 10 times the week of March 23, sending ash skyrocketing as high as 65,000 feet into the air. The eruption of Redoubt poses a threat to national and international aviation as volcanic ash is sent into the busy North Pacific flight paths between North America and Asia. Ash fall has been reported in towns and cities around Cook Inlet, including a trace in Anchorage. Volcanic activity is expected to continue for days to months. Scientists from the Alaska Volcano Observatory (AVO) issued daily public warnings of an impending eruption beginning January 23 after recording increased seismic activity at the volcano. They continue to monitor events round-the-clock, working with colleagues at the National Weather Service and Federal Aviation Administration to minimize social and economic disruption caused by the eruption. Mount Redoubt Volcano has been assessed by the U.S. Geological Survey (USGS) as one of the nation's highest-threat volcanoes. USGS is working to place monitoring equipment on all volcanoes that pose the greatest threats to public safety. Redoubt last erupted explosively nearly 20 years ago, sending ash plumes 40,000 feet into the air and causing engine failure in a 747 jet, which eventually landed safely. For the latest information, go to http://www.avo.alaska.edu/activity/Redoubt.php. Ash radar, quite a tool! Although the Mount Redoubt volcano color code was lowered from orange to yellow a few weeks ago, about the time scientists brought a volcanic ash radar dish to Kenai, it didn't take long for the new device to prove its worth. All set up and ready to go, the radar went to work tracking ash from several Redoubt eruptions last week. "We've been using it; it's working really well," said geophysicist David Schneider with the U.S. Geological Survey's Alaska Volcano Observatory in Anchorage, on Friday. "It's been a nice tool," he said. The radar, erected March 12 at Kenai Municipal Airport, measures the amount of ash emitted and the velocity of the erupting plume, giving geophysicists and other volcanologists a sound idea of where the ash cloud will head presenting a severe navigational hazard to aviators and a potential health hazard to beings on the ground. The equipment consists of a 20-foot conex trailer converted into an office and an 8-foot radar dish on a pedestal inside a 14-foot diameter golf ball-shaped dome. The radar is set up near the airport operations building and is operated remotely from the AVO in Anchorage. By measuring reflectives in the ash cloud, the Doppler radar can detect the velocity of things coming out of the volcano -- how fast the particles are moving -- so scientists can determine the amount of turbulence generated by an eruption, Schneider said earlier. This is the first time this system has been deployed to look at a volcano. It was originally purchased in 2004 around the time of the most recent Mount St. Helens eruption and was shipped to Kenai from the Cascades Volcano Observatory in Vancouver, Wash.
"It's giving us more confidence in interpreting data," Schneider said. "To be able to see the particles over the mountain is helpful." The National Weather Service has another weather radar -- NEXRAD -- based in Nikiski, and Schneider said readings from the ash radar can be compared with readings from that one. Other equipment deployed by the vulcanologists includes pressure sensors that can detect pressure waves coming off the volcano's explosive events, Schneider said. Some episodes also are seen seismically. "The radar allows us to see the ash at altitude to determine the magnitude of the eruption," he said. Studying the data from all sources allows AVO to provide as accurate a forecast product as possible. "We try to be 100 percent all the time," Schneider said. "That's a pretty high standard." During last week's eruptions, views of Mount Redoubt from the Kenai Peninsula were obscured by clouds much of the time, but Schneider said the volcanic ash radar can see through the clouds. "When the ash cloud appears (on the radar) we can track it instantly," he said. When asked why central Kenai Peninsula residents are not feeling or hearing anything from the recent eruptions, especially when links from the AVO Web site report such facts as the 1980 Mount St. Helens eruption being 500 times as strong as the nuclear bomb blast at Hiroshima, Schneider said comparing last week's eruptions to the Mount St. Helens eruption is like apples to oranges. "These eruptions are orders of magnitude smaller than the May 18, 1980, Mount St. Helens eruption," he said. "If we had anything like that, you'd feel it." Schneider again thanked the city of Kenai and the airport for allowing AVO to park the equipment there and provide electrical power. "I can't say enough how helpful the airport has been to us," he said. On Friday, airport Manager Mary Bondurant said the morning eruptions caused Grant Aviation and Era to once again suspend all flights from Kenai at least through late afternoon. The Anchorage airport was shut down from Saturday to Sunday afternoon and some flights were cancelled following ash fall events Monday. "The best advice for travelers is still to call their airline first, before heading to the airport," Bondurant said. Phil Hermanek can be reached at phillip.hermanek@peninsulaclarion.com. Alaska's Mount Redoubt volcano shot ash thousands of feet into the air Monday, the latest in a series of emissions that has dusted the state's largest city, Anchorage, and disrupted operations at Anchorage's airport. Ash from Alaska's Mount Redoubt volcano has been affecting airport operations. The "ash emission event" happened at 9:44 a.m. (1:44 p.m. ET) "and produced an ash plume to about 27,000 feet above sea level," the Alaska Volcano Observatory reported. "The event lasted for about 10 minutes." The volcano began a series of eruptions March 22. The observatory last week reported ash clouds as high as 65,000 feet. 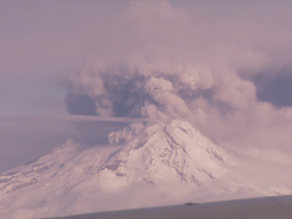 Mount Redoubt erupted three times Saturday, shooting ash to 51,000 feet above sea level. That prompted the closure of Ted Stevens Anchorage International Airport, the Federal Aviation Administration said. Only a trace amount of the ash reached the airport grounds, airport spokesman Jeremy Lindseth said, but it was enough to affect operations. The airport reopened about 2 p.m. (6 p.m. ET) Sunday with one of its three runways operating, airport officials said. A second runway opened about three hours later. The third runway was expected to reopen by Tuesday, officials said. The Alaska Volcano Observatory set its alert level at red, the highest designation. That level indicates that an eruption is under way or imminent and that the eruption will produce a "significant emission of volcanic ash into the atmosphere." Geologists said Tuesday that a dome was building in Mount Redoubt's crater, which could collapse and trigger another eruption. "The difficult thing with these dome-building eruptions -- it is very difficult to give short-term warning because these things can go unstable and fail very quickly, putting an ash plume up to significant heights," geophysicist Stephanie Prejean said. When a similar dome-building episode occurred on Redoubt in 1989 and 1990, the mountain erupted some 20 times, according to geologists with the Alaska Volcano Observatory. Their best guess: Redoubt is not finished yet. The AVO says it is now clear magma has reached the surface, and that's what is contributing to the dome-building in Redoubt's crater. Some of the ash samples they collected Tuesday from the Drift River Valley contained pumice, which also indicates magma has found its way to the surface. Geologists got their first good look at the area around Mount Redoubt on Tuesday, more than a full day after the volcano began erupting late Sunday night with the first of six violent explosions. The most recent eruption came at about 7:41 p.m. Monday, and mudflows have surrounded a Cook Inlet oil terminal, which had to be evacuated. The eruptions scattered ash across a wide swath of the Susitna Valley, but evidence of the eruptions is more dramatic on the mountain's flanks. In a flight over the area Tuesday, officials with the Alaska Volcano Observatory couldn't see Redoubt's summit -- but they could see the eruptions' fallout, starting high on the mountain on the Drift Glacier. "There was a huge flow of muddy water cascading down the middle of the Drift Glacier, cutting a deep channel in the glacier with some really impressive waterfalls," AVO research geologist Kristi Wallace said. "So this is really muddy, sediment-laden water." From the glacier the mudflows swept through the Drift Valley, uprooting some trees and stripping others of limbs and bark. The flows, a mile wide in some spots, continue on to Cook Inlet. As of 11 p.m. Tuesday, there were no ash fall advisories in effect and flights in and out of Ted Stevens International Airport remained unaffected. But with more eruptions a strong possibility, that all remains subject to change. Ash has primarily scattered to the north of Redoubt and has been reported as far north as Healy near Denali National Park, and even Delta Junction. Chevron Corp.’s Drift River oil terminal in Alaska has been shut down following extensive flooding in the area from a volcano eruption earlier this week, a state government agency said. The terminal supplies Tesoro Corp.’s Kenai refinery, Mickey Driver, a spokesman for Chevron, said in a telephone interview. The terminal handles 8,200 barrels of crude oil a day from Exxon Mobil Corp., Pacific Energy Resources and Chevron, said Driver. Chevron has not shut in production from the Cook Inlet and can store between seven and 10 days of output near platforms, according to Driver. No spill has yet to be found, from tanks holding 145,000 barrels of Cook Inlet crude oil on site, according to the report from the Alaska Department of Environmental Conservation. The terminal and related pipeline were shut early March 23 following the eruption of Mount Redoubt. The terminal can hold at least 1 million barrels. The Cook Inlet pipeline to the terminal has a capacity of 225,000 barrels of crude a day, and mainly serves the local refinery market, according to Chevron’s Web site. The Tesoro refinery can process 72,000 barrels of crude oil a day, according to the company’s Web site. Alaska Airlines said it’s cancelled 19 flights due to the eruption of the Mount Redoubt volcano near Anchorage. Nineteen flights into Anchorage and flights out of the city were cancelled “as a safety precaution related to the pattern of ash at altitude created by the eruption of Mount Redoubt,” the airline said. Alaska Airlines, a subsidiary of Alaska Air Group Inc. (NYSE: ALK) of Seattle, operates up to 50 flights a day in to Anchorage. “We recognize these cancellations will significantly impact our customers intending to travel to or from Alaska,” said Ben Minicucci, COO and vice president of operations for Alaska Airlines, in a statement. Alaska volcano eruptions continue, while the largest was recorded on Sunday night. The explosion occurred from four to thirty minutes. While it is not clear how long Mount Redoubt will continue to erupt, the Alaska Volcano Observatory (AVO) isn't taking any chances. "It's coming down," Rita Jackson said, about 50 miles north of Anchorage. Alaska volcano eruption ashfall could be found 50 miles away from the core. Ash deposits could be found on cars within a 50 mile radius. AVO has received no new reports of ash emission since early Monday morning. Ash fall advisories have been posted by the National Weather Service. Redoubt continues to be at a red alert level while seismic activity is elevated. The AVO reports that ash clouds reached 60,000 feet above sea level, with ash volumes between 25 - 30,000 feet above sea level. Traces of ash fall have been reported in Skwentna, Talkeetna, Wasilla, and Trapper Creek. The last Alaska volcano eruption caused melting of the Drift glacier which discharged down the Drift River. The eruptions were preceded by approximately 60 hours of discrete earthquakes under the volcano. AVO raised the Aviation Color Code/Alert Level from YELLOW/ADVISORY to ORANGE/WATCH on Saturday. Mount Redoubt showed signs of volcanic unrest since the beginning of Fall 2008. The unrest had escalated in late January 2009. Last Sunday's volcano eruption produced the first ash which raised the alert level to RED/ADVISORY. The AVO cautioned that further explosive activity could occur with little or no warning. Volcanic eruptions could occur intermittently for weeks or months. Sunday's eruption produced 40 to 50 earthquakes each hour. Alaska: Volcano erupted 6 times already! WILLOW, Alaska (AP) - Alaska's Mount Redoubt volcano erupted Monday night for a sixth time in less than 24 hours, sending an ash plume more than 9 miles into the air in the volcano's first emissions in nearly 20 years. The Alaska Volcano Observatory reported that the sixth eruption came at 7:41 p.m. Monday. Web cameras showed steaming from the summit after the ash emission ended, the observatory said. The five earlier eruptions came late Sunday night into Monday morning. Residents in Anchorage, the state's largest city, were spared from falling ash, though fine gray dust fell early Monday on small communities north of Anchorage. The National Weather Service forecast more light ashfall in the same area through Tuesday morning. "It's coming down," Rita Jackson, 56, said Monday morning at a 24-hour grocery store in Willow, about 50 miles north of Anchorage. She slid her fingers across the hood of her car, through a dusting of ash. Ash from Alaska's volcanos is like a rock fragment with jagged edges and has been used as an industrial abrasive. It can injure skin, eyes and breathing passages. The young, the elderly and people with respiratory problems are especially susceptible to ash-related health problems. Ash can also cause damage engines in planes, cars and other vehicles. Alaska Airlines on Monday canceled 19 flights because of the ash. In-state carrier Era Aviation canceled four, and Elmendorf Air Force Base in Anchorage kept 60 planes, including fighter jets, cargo aircraft and a 747 commercial plane, in shelters. Five of 20 Alaska state senators were scheduled on the morning flight from Anchorage to Juneau, which was canceled. As a result, consideration of legislation, including a resolution accepting federal stimulus funds, was delayed. The first eruption, in a sparsely populated area across Cook Inlet from the Kenai Peninsula, occurred at 10:38 p.m. Sunday and the fifth happened at 4:30 a.m. Monday, according to the Alaska Volcano Observatory. The wind took the ash cloud away from Anchorage, toward Willow and Talkeetna, near Mount McKinley, North America's largest mountain. There were reports of a quarter-inch of ash in Trapper Creek and up to a half-inch at a lakeside lodge near Skwentna. Dave Stricklan, a hydrometeorogical technician with the National Weather Service, said the ash falling at a distance was likely "just kind of a light dusting." He said the significant amount of ash probably dropped immediately, right down the side of the volcano. "The heavier stuff drops out very quickly, and then the other stuff filters out. There's going to be a very fine amount of it that's going to be suspended in the atmosphere for quite some time," he said. "The finer ash is going to travel farther, and any ash can affect aviation safety." Jackson said she was taking a sip of coffee when she tasted something funny on her lips - ash. She was experiencing other effects, too. "My eyes are itching really bad," she said as she hurried to get out of the store and to her car. Jackson, who unexpectedly got the day off, hurried home from the grocery store to secure a motorcycle, snowmachine and vehicles under protective blue tarps. The 10,200-foot Redoubt Volcano, roughly 100 miles southwest of Anchorage, last erupted during a four-month period from 1989-90. In its last eruption, Redoubt sent ash 150 miles away into the path of a KLM jet and its four engines flamed out. The jet dropped more than 2 miles before the crew was able to restart all engines and land safely. The plane required $80 million in repairs. The volcano became restless earlier this year. The observatory had warned in late January that an eruption could occur at any time. Increased earthquake activity prompted scientists to raise the alert level for Mount Redoubt on Sunday. On Sunday morning, 40 to 50 earthquakes were being recorded every hour. A steam plume rising about 1,000 feet above the mountain peak was observed Saturday. Three seismometers on the mountain were damaged in the eruption but seven others remained in place, said observatory geophysicist John Power. Power said the history of past eruptions of Redoubt indicate the volcano could erupt again in the next few days or weeks. "It's something we need to stay prepared for," he said. Associated Press Writers Dan Joling and Mark Thiessen in Anchorage contributed to this report. Flights in and out of Fairbanks have resumed today after being halted on Monday by ash clouds from Mount Redoubt volcano, according to Alaska Airlines. Sixteen late-night and early-morning flights to Alaska were canceled due to another eruption of Redoubt late Monday. Airplanes wrapped in a protective plastic sealant and stationed overnight in Anchorage were unwrapped this morning, inspected and prepared for passenger flights. The sealant is designed to protect aircraft from abrasive ash particles. Travelers may check status of flights at www.alaskaair.com or 800-ALASKAAIR. The airline says delays and cancellations are still possible pending further volcanic activity. Flights were disrupted and airlines placed on alert after an undersea volcano erupted off the coast of Tonga and shot clouds of smoke, steam and ash thousands of metres into the sky. Both Airways New Zealand which manages air traffic and MetService have issued a warning to aircraft flying in the area. New Zealand flights were forced to fly around or over the ash and smoke, which reached up to 15,000 metres, an Airways NZ spokeswoman said. Volcanic ash cannot be detected by planes' weather radar but can cause multiple engine failure. In 1990, a KLM Boeing 747 lost all four engines while flying through a volcanic ash cloud in Alaska. The Tongan volcano, which is believed to have erupted on Monday, spewed columns of ash from the sea about 10km from the southwest coast off the main island of Tongatapu, where up to 36 undersea volcanoes are clustered, said Tonga's geological service head, Keleti Mafi. "It's a very significant eruption, on quite a large scale." Trade winds were blowing gas and steam away from the island so there was no danger to residents. A volcano in southwestern Colombia has erupted for the third time in a month, sending a column of smoke up to five miles above the rim (eight kilometers) and spewing ash on nearby towns. No damages or injuries have been reported. The two eruptions of Mount Galeras on Friday marked the third time the volcano has come to life recently. It also erupted on Feb. 14 and Feb. 20. On Feb. 14, the eruption blanketed the nearby provincial capital of Pasto in ash and prompted the evacuation of 7,000 people living in its shadow. Friday's eruptions also led officials to prepare shelters for nearby residents as a preventive measure. A volcanic observatory in Pasto reported that ash fell in different directions over towns closest to the volcano.